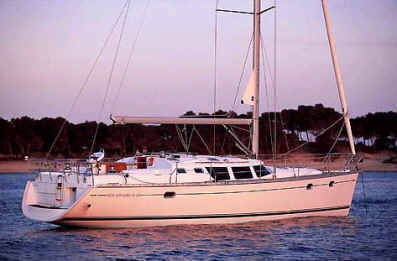 The Jeanneau 43 has classic slab and roller reefing, one wheel steering and a electric anchor winch. There is a bimini and dodger, an ondeck shower and BBQ,AM/FM radio & CD player, fully equipped galley with LPG stove & oven, fridge/freezer, pre-charter cruising guides, full boat and chart briefing. Optional extras include an outboard engine for the tender, a skipper and a provisioning service.